The turkey vulture is one of North America's largest birds of prey. It reaches a length of 32 inches with a wing span of 6 feet. Its overall color is brown-black with a featherless, red head, white bill and yellow feet among mature adults. Immature birds have a darker face. Although usually silent, the bird will occasionally emit a soft hiss or groan. 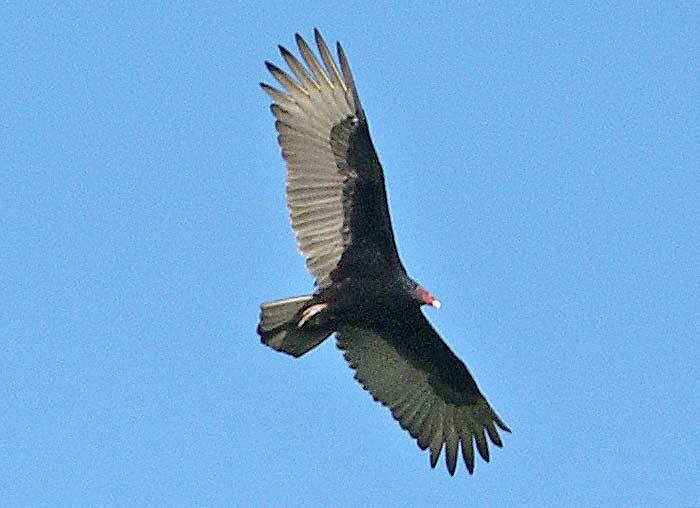 In flight, the turkey vulture rocks from side to side, rarely flapping its wings which are held at a V-angle called a dihedral. Silver-gray flight feathers look lighter than the black lining feathers of the underwing. Its long tail extends beyond its legs and feet in flight. Throughout all the deserts of the Southwest, as well as most of North America. Dry, open country, ranch lands and along roadsides where carrion is common. Vultures are best known for their practice of feeding on dead animal carcasses, but will occasionally attack young and helpless animals as well. They obtain much of their water from the moisture in carrion, and their powerful kidneys enable them to excrete less water when expelling waste products. 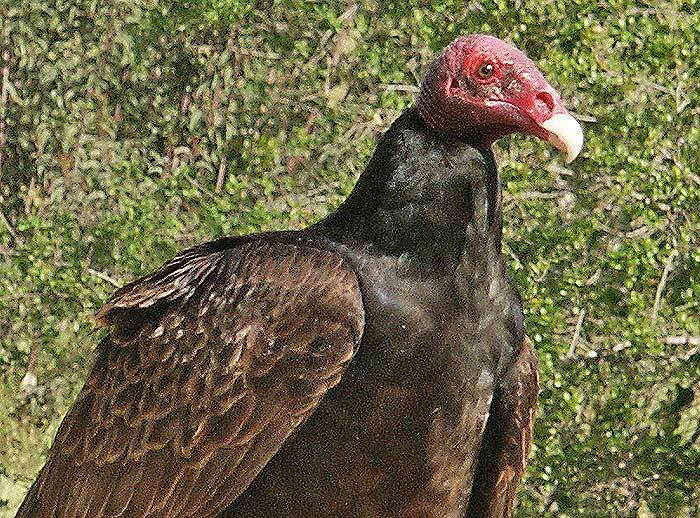 Turkey vultures, like other carrion birds, are protected from diseases associated with decaying animals by a very sophisticated immune system. Their unfeathered "bald" head is easy to keep clean and is characteristic of vultures and condors throughout the world. Mating occurs in all deserts except the Mojave. One to three blotched eggs are laid in cliff hollows, logs or among rocks on the ground; no nest is built. Both parents participate in incubation of the eggs for up to a month. Newly hatched young are fed with regurgitated food for the first few days and fly from the nest within 10 weeks. Unlike most birds, vultures have a keen sense of smell. The turkey vulture's olfactory sense is estimated to be three times that of the smaller black vulture, which is also found in the North American deserts. The California condor, now almost extinct, is the third member of the Cathartidae family, referred to as the American vultures. Vultures are sometimes mistakenly called buzzards, the British name for buteos -- hawks of the Buteo genus.